Markets end lower. Markets are in consolidation mode after a rally in previous two consecutive sessions. The benchmarking indices dragged by profit taking by banks, oil, Tech and capital goods stocks. Also weak rupee also weighed on investor sentiment. Mumbai: Markets are in consolidation mode after a rally in previous two consecutive sessions. The benchmarking indices dragged by profit taking by banks, oil, Tech and capital goods stocks. Also weak rupee also weighed on investor sentiment. 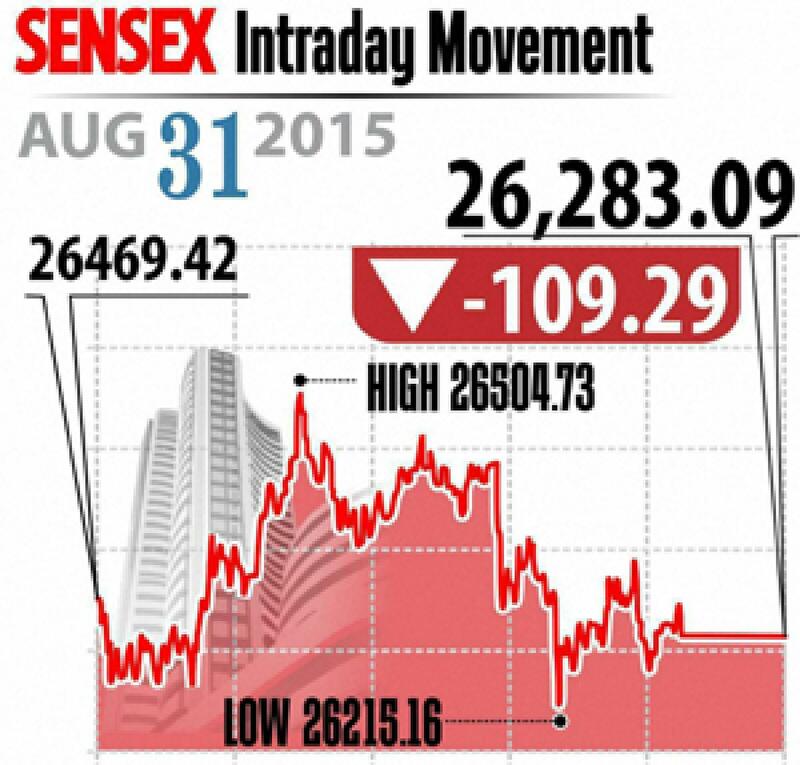 Sensex was down 109 points at 29,283 and Nifty ended with 31 points lower at 7,971. The broader markets also underperformed with midcap and smallcap indices down 0.2 per cent each. As the global markets still continue to be weak, the markets are getting volatile and there is no trigger seen for the markets to go either way. In view of huge volatility, the traders are not willing to continue their positions, say analysts. The Indian rupee continued to be weak down 34 paise at 66.48 against US dollar amid demand for dollar coming from importers. Among the heavyweights, RIL and Infosys were down over 1 per cent each. From banking space, investors are seen booking profits with ICICI Bank, HDFC Bank and HDFC down up to 1 per cent each. On the other hand, from private bank space, IDBI Bank gained 3.5 per cent. From oil stocks, ONGC up by 0.7 per cent as the company along with its partners is investing about $24 billion in Mozambique oil field and converting the natural gas into LNG to export to Indian customers. The gainers: Lupin, up 3.55 per cent at Rs 1,928.85; Cipla, up 3.30 per cent at Rs 681.50; Dr Reddy's Lab, up 3.15 per cent at Rs 4,310.15; Coal India, up 2.50 per cent at Rs 366.35; and Vedanta, up 2.34 per cent at Rs 98.60. The losers: BHEL, down 3.45 per cent at Rs 226.50; Bharti Airtel, down 2.14 per cent at Rs 354.50; Hindalco Industries, down 2.08 per cent at Rs 80.05; ICICI Bank, down 1.92 per cent at Rs 278.10; and RIL, down 1.65 per cent at Rs 856.80.